Blurb: Saving the world one damned person at a time—shy advice columnist-turned-oracle must find a way to save her dangerous demivampire lover from the fate that threatens each of his race: evolution and the destruction of his soul. I'm thrilled to be hosted by the Reader Girls today! I've been thinking about which excerpt I'd share today and it wasn't an easy task. Should I offer a glimpse of my demivamps? Should I tease with a peek at Sophie and Marek's attraction to each other? Should I introduce the other players in my Demimonde? Eventually, I took a step back and considered the great blog that offered to host me. This is a FAMILY blog—so what better excerpt than the scene that my own sister liked the best? Circling wide around the seating level, I surveyed the scene. The ring of booths and tables sat four wide steps higher than the round dance floor. Smart, I thought, since part of going dancing was sitting and watching, scoping out likely prey. Eh, wrong choice of words. I swallowed against a dry spot in my throat. A group of young women got up from a nearby booth and started down the steps. Flashes of colors glinted in more than one set of eyes as they glanced around. Spotting me, they waved at me to join them. I didn’t really want to, but as far as I understood Marek’s intentions, I had to mingle with the DV. One of these girls might be his niece or cousin. I couldn’t risk insulting anyone by being standoffish. If my lack of grace embarrassed them, so be it. Turned out, it wasn’t so bad. The sociable girls didn’t act like silly kids, which in turn didn’t make me feel like nursing home fodder. I discovered I could actually move despite the fantastic shoes I wore, and, even more surprisingly, I enjoyed myself. Our little group expanded a little at a time and new people mingled through. As the songs changed, so did the crowd. By the third song, I realized one of the newcomers seemed intent on dancing with me. Alone. He was roughly my height and had short dark blond hair ruffled up in tousled waves and soft spikes. A mischievous grin was framed by a devilish goatee, and he danced like a show-off. I brushed him off with a small shake of my head. I didn’t want a partner. Instead of moving on, he changed tactics to keep my attention. He’d dance mockingly behind someone else’s back, smoothly switching moves if they’d turn around and spot him. The other girls caught on, giggling and pointing out suggestions for his next target. He’d stop just as they turned around to see the commotion behind them. Eventually, his luck ran out and, needless to say, the victim wasn’t as amused as we were. Grabbing the imp by his collar and his belt, the offended man hoisted him easily over his head and threatened to toss him up over the booths. The girls rushed to the rogue’s aid, pleading for his release even as he laughed and dangled upside down over us. “Name it,” I said boldly. “You’ll dance with me.” He stared right into my eyes. “Damn!” The troublemaker’s voice was drowned out by the girl’s indignant shriek as she tried to jump up and club him. He didn’t look like he suffered too much, considering the jumping animated her cleavage. “On second thought, maybe he’s safer up there...” I grinned up at him as he tried to fend off several well-aimed swats. “Thanks a bunch, Tanner!” The little demon yelped as he took off, Chesty Girl in hot pursuit. Her friends rolled their eyes as if they’d seen it all before. I tried not to stare slack-jawed at Tanner. I couldn’t get over these muscles. Marek hadn’t lied when he said the DV had accelerated strength. It was obscene. “Now we dance.” He drew me away from the rest of the girls. The beat picked up with the next song and, lights flashing above and below, the crowd bounced along. Tanner must have been born to dance. He glided and rolled with a fluidity I’d never seen. At one point I tried to imagine Marek dancing but laughed and gave up. Marek could move but not as serpentine-like as this guy. Tanner was a preternatural John Travolta a la Saturday Night Fever, right down to the dark wavy locks and hairy chest peeking out of his open collar. Gradually, the beat relented, winding its way down into a slow song. Not wanting to close-dance, I smiled a Thanks-and-So-Long smile. Tanner blinked lazily and grabbed my hand, tugging me off the floor. “Let’s go shoot some pool.” His white teeth, straight and non-pointy, glinted strangely under the black lights. Climbing the steps out of the bowl, he tugged me toward the hall that led to other parts of the club. I didn’t want to but I was here to mingle at Marek’s command. Reluctantly, I nodded my head and tried to look like I thought it was a great idea. The hallway leading to the pool room was crowded with snoodling couples and laughing girls. Tanner draped his arm around my shoulders and squeezed us through. His hands were getting too nosy and I had to keep moving them out of forbidden territories. I hated grabby guys and he was definitely grabby. Wishing I had my cell phone, I began planning a polite escape. I screamed. B-movie perfect every time. Every girl around me screamed back, playful, mocking, echoing it and canceling it out. No one moved to stop him. My mouth hung open in dismay as I wildly scanned the disinterested crowd. No one looked. No one cared. “I love vamp security.” Tanner growled, showing teeth. He darted his head down for a kiss, hard and rude. Twisting my head away I slapped him, the snap of the impact hurting my hand. “As if. You can’t turn me vamp. I’m not stupid.” I pushed my way past and he stood his ground, forcing me to slide against him. He caught me around my waist and wrenched me back, thumping me into the wall. "Neither am I.” He grabbed my jaw and twisted my head up, forcing me to look at his face. His eyes were wolfy, the color of burned oranges and Autumn rust. "I'm Were." When my sister Jenny told me this was her favorite part, I just had to find out why. I mean, Tanner was a sleaze. There weren't any Demivamp hotties to be found. Why this one? "Because," she said. "This was the part where I knew I couldn't put the book down until I'd finished it." Thank God she told me this over the phone...I 'm glad she couldn't see me blush. How cool is that? My kid sister told me I'd hooked her with my book. It was a page-turner. It was consuming. I kinda teared up a little bit. However, we had more good days than bad and we've grown to care about and respect each other very much. To hear that my big-shot executive sister likes my book and is hoping to beta read the sequel…well, it's a proud moment. Part of me still hopes the world will fall in love with my story (hey, I'm a writer. I dream big!) 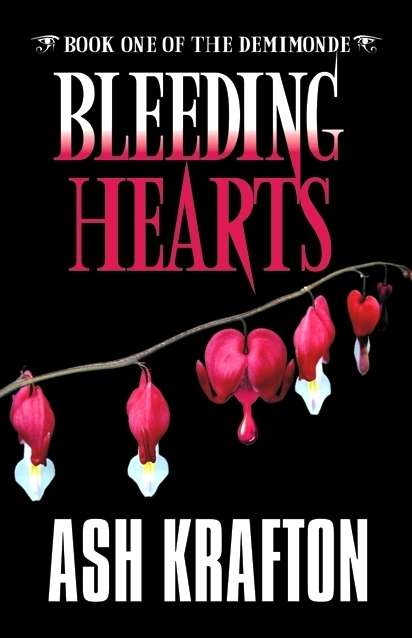 but most of me is satisfied that the friends and family I hold nearest and dearest have enjoyed reading BLEEDING HEARTS. And yeah, my mom likes it, too…but she was a little bit more free with her "helpful suggestions". Her biggest one was: does Sophie have to be so sarcastic? I think my mom misses yelling at her mouthy teen-aged daughter J I better get her in on the beta reads, too! GIVEAWAY: Thanks for having me, Reader Girls! 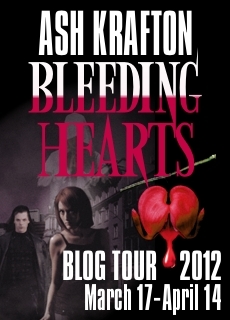 I'd also like to let everyone know that the Bleeding Hearts Blog Tour will continue until April 14, 2012. The tour dates can be found here. Be sure to check out the other stops along the tour for other posts about Bleeding Hearts and be sure to enter the huge end-of-tour prize package here. Good luck to everyone who enters and thanks for celebrating my new book with me. Ash Krafton's work has appeared in several journals, including the Absent Willow Review, Abandoned Towers, and Silver Blade. 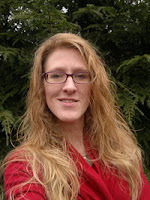 Ms. Krafton resides in the heart of the Pennsylvania coal region and is an active member of Pennwriters, a national writers group. She lurks near the Spec Fic Chick website and is looking forward to the release of her first novel, Bleeding Hearts. I can't wait to read this book!!!! Thank you for the fab giveaway. My younger brother is my biggest critique partner so I know when he praises me its worth something. This excerpt was great and she's right- totally has me hooked. I loved the excerpt! Your sister was right because I have to know what happens next! And I know exactly what you mean about little sisters, it's like an OMG moment when they praise you for anything but those are pretty rare. I actually just got done yelling at my little sister and her boyfriend for drinking all of the cold pop lol Thanks for the giveaway! Sounds really good. Cant wait to read more. BLEEDING HEARTS does look very interesting & I loved the excerpt thank you. Looks great. I would love to read this.